Exciting news from the Facebook camp, as they have revamped the Pages. Main thing: they're bringing them more in line with how personal pages work. Which means you no longer will use Tabs to navigate; instead these different sections will sit on the side. And you will also be able to integrate the Like button on individual sections (i.e. the ex-tabs). And what strikes us a major one: as an administrator, you can start interacting as the Page on content outside of your page. That's big news for brands. As always with Facebook, the changes are extensive and finicky. These 2 blogposts on Econsultancy and Dose Of Digital give some good detailed info on the ins and outs of the changes. Does social media create & sustain flat hierarchies? …how will people know your tweets are so good? One mechanism, of course, is retweets. The number of retweets, however, may depend on how many followers you have to catch and retweet your posts in the first place. This means that those who have a large number of followers end up with an advantage even in terms of being recognized as meritorious. Multiple mechanisms can facilitate preferential attachment — this need not be a mere exposure effect but will likely be confounded by a popularity effect. In almost all human processes, already having a high status makes it easier to claim and re-entrench that high-status. Thus, not only will more people see your tweets, they will see you as having the mark of approval of the community as expressed in your follower count. 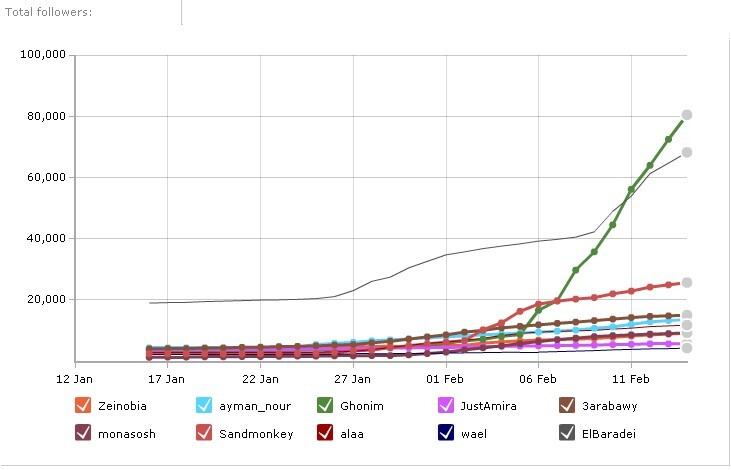 She made a fascinating graph of the ten most popular Egyptian bloggers / Twitter users; while they start out on more or less the same level, Ghonim, the Google marketing exec, and the seasoned Elbaradei, rise dramatically. Another infographic of note is this one on the Egyptian influence network, which is a snapshot of about a week ago. Try and spot Ghonim. Perhaps you remember our description of how search engines like Google work. But paying for links is cheating. Google promptly demoted JCPenny to several pages down the search ranking. A much bigger problem for Google for some time now has been the so-called content farms. These are websites that scrape content from other sites like Wikipedia or Quora or pay people to create mediocre but keyword-rich pages. The key though is that they rank highly in search, generating lots of traffic and earning their owners advertising dollars. A few weeks ago we suggested that Google should go the social way and allow users to report these sites. Interestingly enough Google announced a plugin for Chrome this week that does exactly that, it allows you to join the battle and report the content farms. As far as symbolic gestures go, this is a strong one. To celebrate the fact that they got 1 million Facebook Fans, Porsche decorated one of their cars with the names of their fans. Not all 1 million of them, but the 27,000 who indicated on the Facebook Page that they would like to be part of it. Cute idea. Shame it's built in Flash, which means all those Porsche lovers can't see it on their iPads. And shame that the find-your-name-on-the-car function doesn't really work. Still, it's the gesture that matters. While keeping our eye on interesting new influence measuring tools, we stumbled upon this excellent post on Traackr's blog. The point being made is that, because of increasingly sophisticated ways of measuring people's interests, marketing is entering an era where demographic becomes meaningless. Demographic is essentially a way to make crude statistical assumptions about users' interests, given that they fall within certain social parameters, like age, gender, and geographical location. Once it is possible to search for users by topic of interest, demographic becomes almost useless. Nokia's new CEO, Stephen Elop – an ex Microsoft man – has exhorted his company to jump off a burning platform to save themselves. In other words: ditch Symbian and partner with Microsoft. It must rank as one of the most emotive corporate memos ever. But many people are not having it. A few young ex-employees wrote a memo to Nokia shareholders, asking to be elected on the board. They agree that Symbian has to go, but they feel Nokia should speed up development of its own operating system Meebo. And ditch Elop. But today the wildly popular Facebook page they had created to gather support, vanished along with their Plan B manifesto. It turns out it was a hoax from a bored engineer, that "really likes his iPhone". Or was it? This week the Virtual Music website released their yearly 'heat map', a visualisation of web-based music consumption in the US. The first graph shows that a lot of services are green, i.e. online music consumption is up. But what made us sit up is the second graph, which shows that YouTube as a platform for music consumption is 3 times as big as all of the other Pandoras, Last.FMs and Groovesharks combined. The ITU forecasts in a forthcoming report that the number of smartphones in use will rise from today's global estimate of 500m handsets to almost two billion by 2015. Gemalto, a company that brands themselves as world leaders in Digital Security, has just managed to get Facebook to run on a SIM chip.